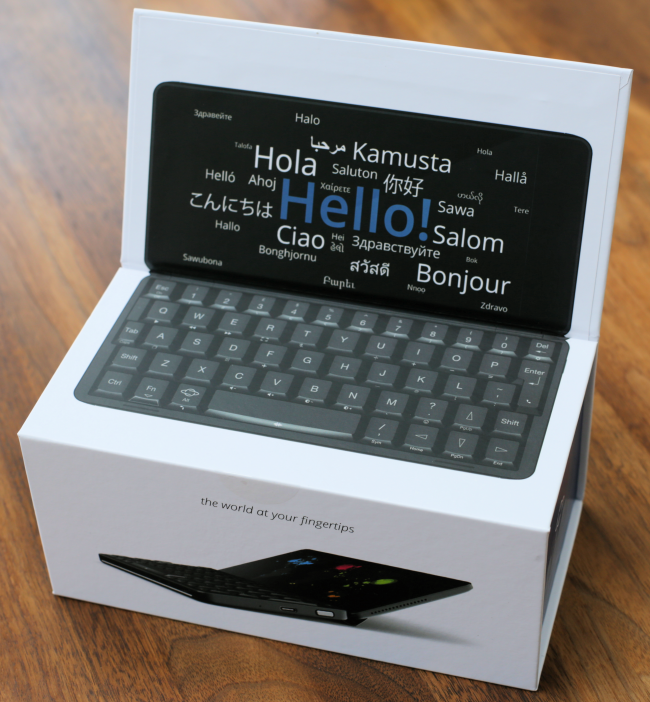 When I backed the Gemini project exactly one year ago, I was excited to be contributing to something that promised to be a bit different: a connected device with a full physical keyboard akin to my beloved Psion 5. It seems many others felt the same: the project has now secured more than $2 million in crowd-sourced funding. My Gemini and its accessories arrived last week. The packaging is impressive for a small-scale and relatively inexpensive product. The box’s magnetic clasp and folding design cleverly mirror the Gemini’s clamshell design. The accessories are all packaged ready for display in a retail environment, clearly reflecting Planet Computers’ desire to get the device into shops at some point. The hardware is well made, and the designers have done a good job in reproducing the Psion’s metallic grey covering, making the closed device quite distinct from the black slab that characterizes almost every other mobile phone on the market. Of course, the black slab is revealed once the device is opened. The keyboard on my device doesn’t quite match the quality of my 1999 vintage Psion, and a few other owners have reported wonky or malfunctioning keys. Yet it’s still perfectly usable, and I’d forgotten how much better a keyboard makes typing URLs, filling in forms and writing e-mails. As promised, the device has two USB-C ports, although the realities of production have meant that each of them is limited to certain functions; the device can only be charged through the left-hand one, the HDMI adapter only works in the right-hand one, for example. A dongle to connect an Ethernet cable and two or three USB devices turns the Gemini into a desk-based mini-computer, but the inability to charge the device at the same time will limit usage to a few hours. The software still has a very “version 1.0” feel to it. The underlying Android operating system works pretty much as expected, although integration with the Gemini’s keyboard and landscape screen is still patchy. Some standard Android applications refuse to display properly unless the screen (and the device) is rotated into portrait mode. Some functions still need touches on the screen, which reduces the ease that keyboard input offers. And some software in these early devices simply doesn’t work yet: Planet Computers has yet to deliver the Agenda application that for many users will form the main purpose of the Gemini. LEDison, an application that illuminates a row of external LEDs to notify users of calls, texts, e-mails and calendar events currently lacks the hooks needed to interact with other programs. Yet despite these initial shortcomings, I’ve fallen in love with the Gemini. The device’s quirks remind me of an age when mobile technology was still in its infancy, and its first faltering steps were to be admired and encouraged. Like diligent parents, Planet Computers has so far been careful to respond to Gemini owners’ concerns and problems, often in personal e-mails. In general, reactions from users have been positive, with early backers pointing out the difficulties of designing, manufacturing and delivering a mobile device in a little over a year with a tiny team of employees. In 1999, having a personal digital assistant required patience and commitment. Now, every Amazon Echo has a digital assistant that “just works”, but, it seems to me, fails to engage their owner. However, I admit I might be wrong in that detail: Amazon has recorded more than 250,000 people asking its Alexa virtual assistant to marry them.